Private cabin with excellent mountain views a short 10 minute drive from downtown Brevard headed south. This cabin has cathedral ceilings, gas log stove, covered deck and grill. On the main level there is a king sized bed and on lower level there are two twin beds. In the lower level den there is a full-sized futon that folds flat if you have more than four guests (it can sleep 2). There is a TV upstairs in the master bedroom and another on the lower level. 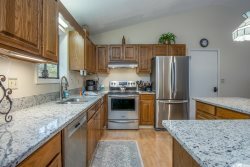 The home is well equipped in the kitchen with a dishwasher and dining room table for four. The living room has chairs and loveseat, more seating on the deck where you will spend most of the time. There is a gas grill on the upper deck. The main bedroom has a 32” tv, but no DVR.,and picks up local PBS and ABC channels off the antenna. We had a very nice time. Everyone at White Squirrel Realty was pleasant. Our stay at Mai's Rock was excellent. Will rent direct next time instead of VRBO due to all of the "unnecessary" fees that they charge you. Isaac was so helpful/ we appreciate how he helped us after hours!! We really enjoyed our week and we will come back! !